I have typical cruddy, yellowed white headlight surrounds on my repainted car and I want to restore them the best I can. Painting them would be easy and look o.k. but I know it is kinda frowned upon by the purest because it is not original and I agree. Any known tricks out there ? I've been told that bleaching them with Clorox will take out some of the yellowing from age. Also same idea with the windshield washer bottle, rear trunk latch cups, etc. in the white or translucent plastic parts. But I've not tried it yet with mine, so can't attest to it's efficacy. media blast them, do not sand blast them & then paint. Bleach - use a 25% solution (or less). Soak for 3-5 days. Rinse, let dry. They will look a lot better but remember - these guys are 43 years old! They won't be bright white again AND the bleach (even diluted) will have a negative affect on the life of the parts. This worked for ONE set for me, but no others. OR....paint. No, they didn't come this way, but they can look pretty good if done right. Did 2 sets this way(with a lot of prep work). Looked good, but you could tell they were painted. Thanks for the tips guys. Since this is not a concours car I will paint them to compliment the new silver finish. Sandblasting will ruin the original finish!!!! DO NOT DO IT!!!! Painting makes the surface lost. Bleach and leave alone. These are painted. using the Krylon plastic primer and Rustoleum Shell White Satin Finish, 7793830 - 12 oz. Spray Looks far better than my original set on my 914/6. These are the best originals I have seen. The painted method looks great, if done correctly. The white ones on my '71 are painted black. I heard oxyclean works as well as bleach. I've had ok luck with the windshield washer bottle. It's hard to reverse 45 years of chemical reaction on the plastic. I'm pretty ok with white plastic paint on white plastic. I won't loose sleep at night. I appreciate that Scotty b sweats the details. Try soaking in '30 Second Cleaner'. Or make your own with bleach and TSP. You MUST completely immerse the cover or the solution will leave a distinct line on the part that's not in the solution. The longer you soak the lighter the cover. a quick follow up. I stripped one of the painted surrounds I had with aircraft stripper. It got it to a stained white. It looks like the primer and paint bled into the plastic. The next thing I did was to sand a section with 180 grit. It made it better but still slightly discolored. Next step is to try a soak in oxy clean today. I'll get some pics of the sanding I did then the half I soak in Oxy for a day or 2. White ones must be out there, what does a good pair they go for ? I couldn't find any three years ago when I started looking for white surrounds for my '70, so I purchased the last two sets from EASY in Emoryville that were not too far gone and were restorable. Bought a gallon of 30 Second Miracle Cleaner too but I haven't got around to trying it yet. It's on my list of things to do soon. Thanks Scotty. I would prefer no paint on them if possible. 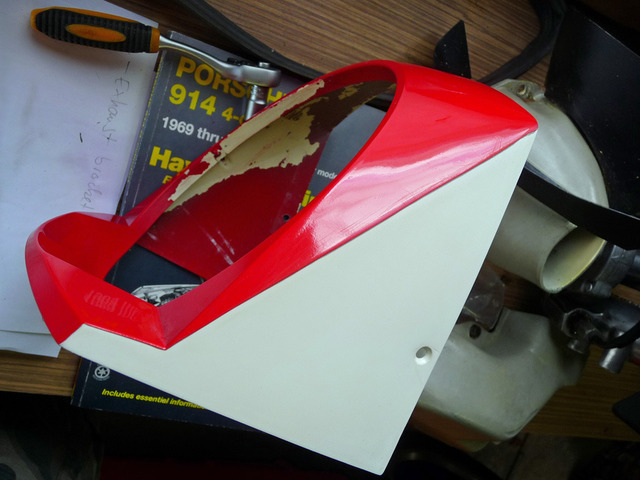 Absent that, a plastic paint that as closely as possible matches the original will have to do. Agree! Never sand blast these. I wouldn't blast them with anything because they are PLASTIC.Try soaking in 20% sodium hypochloride ( that's concentrated bleach) after they've been hard-core cleaned. Soak for 48 hrs. Some will look brand new...others not. If not, paint the suckers. Ooooh, you could try to powder coat them! JOKE! please disregard!!!! 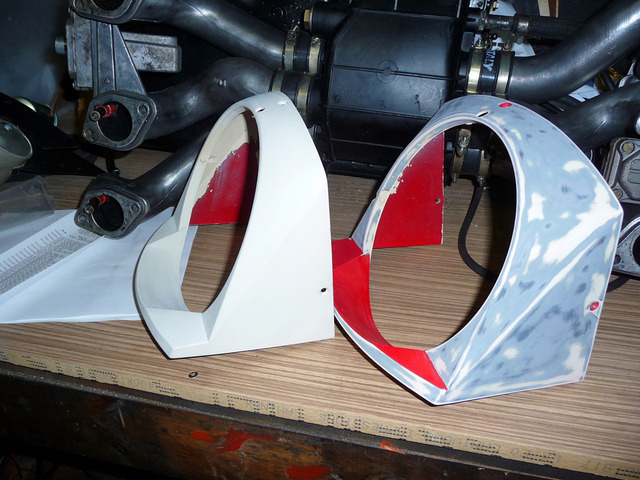 One of these was black paint directly on the plastic, the other was red oxide primer over spray. I have a couple more that had grey primer, grey primer + black paint etc. I'll try one of the grey primer ones next. Hopefully the staining won't be as bad as the black and red. I was asked to provide an actual paint code for what I used by PM, and I ened up editing my post as I did NOT use FUSION paint, only Primer. It was a Rustoleum Paint. See link in my previous post. Is it better to use walnut shell or soda media on plastic? Started with 3 unpainted very good condition surrounds. Untouched & bleached,& bleached and 600 scotch bright pad, and light polish. Just noticed that one set has part numbers, I think these were from a 70. Great thread! Motivates me to try and strip the signal orange paint of my original housings! Does Acetone affect the type of plastic they used for the housings? 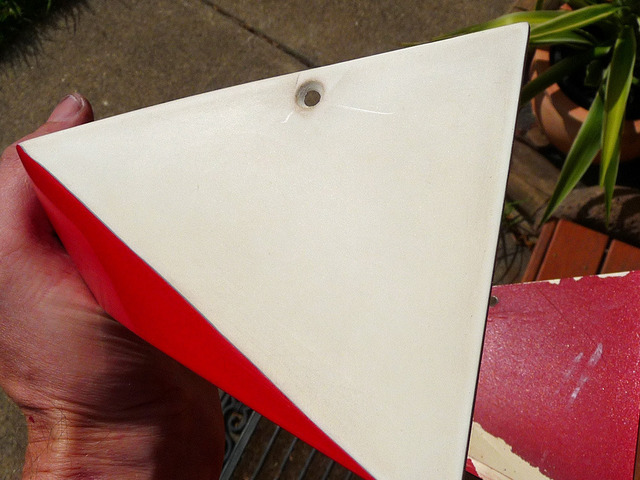 Mine are painted red so I'm about to strip the paint off,acetone works great but I only used it on fiberglass parts. ok...I thought I'd give it a go and see how sanding works. I started with 180 until paint and primer were gone,then 240,400,800,1200 to get it nice and smooth. The paint hasn't bled into the plastic at all. It sure takes a while and you could get it even smoother if you put some more time into it,depending on your level of OCD. Pretty happy with the result but will try paint stripper for plastic and see how that works. Would it make sense to use clear coat to preserve it, polish,leave as is? I wouldn't clearcoat them. It yellows with time so the problem returns some day. Watch out for that acetone! It is really carcinogenic! thanks for the reply...I think it'll look good when pollished and without the clear coat. I certainly don't want to sand them down again....almost there! Here are my 914 early head light doors. They are original white plastic and showing some aging (Yellowing). I keep hearing they are only original once ! they look nice. i would leave them as-is. mine were black. bead blasting cleaned them up and paint made them white again but I'm sure they don't look original. Still, I'm happy with the result. Do not paint ! Those are excellent for their age and look right. I am curious...what polish did you use? +1, did you use plastic polish or some kind of auto-paint polish. Here is after 24 hours of the 10% bleach recipe. I am pretty happy how they came out as is. I will try some polish too - maybe the Meguiars plastic polish. I hit them with some Griot's Complete Compound today. Got rid of some light stains and gave them a nice smooth look and finish. All of you are learning well. They mostly look really good. 600, Automotive finishing polish, with silcone. But wax is a good idea after.